AWC Gothenburg’s membership has helped out many charitable organizations, both on a group and individual level. Members take initiative towards charities they have a personal interest in, and the group often joins FAWCO in its charity efforts as well. Currently, the club has a Heart Pillow Project group, which provides free therapy pillows to breast cancer patients. 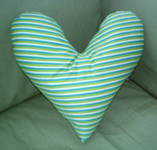 The soft cotton, heart-shaped pillow is stuffed with hypoallergenic stuffing and designed to fit under the arm. Visit the group’s Facebook page or website. Another important charity that AWC Gothenburg supports is Bibi Jann Children’s Care Trust, an organization that oversees Bibi Jann Academy (a preschool/elementary school for over 100 children), Grandma to Grandma (a program for grandmothers of orphaned children), and the Gerrit Brokx/FAWCO House (A shelter for grandmothers and grandchildren who would otherwise be homeless). AWC has held charity raffles and benefits to support the organization’s ongoing work. Visit Bibi Jann’s website. Our club has also participated in local charity efforts like the Pink Ribbon Walk supporting the Swedish Cancer Society’s breast cancer research, and brought attention to FAWCO’s charity efforts. Most recently, the focus has been on FAWCO’s Target Water Project. In the past, the club participated for many years in the Save the Children bazaar and bake sale. The club has also raised money for the Ronald McDonald House in Gothenburg, a ‘home away from home’ where families can stay together as a family while their sick child is being treated at the Queen Silvia’s Children’s Hospital right next door. We even have several members who personally donate their time as volunteers at the Ronald McDonald House of Gothenburg. For more information in Swedish, check out www.ronaldmcdonaldhus.se. We are always open for new opportunities to help out, so please contact us if you have a cause you are interested in.